The decoration of Psalm 52 / 53 ("The fool says in his heart, 'There is no God.'") was created by one of the 14th-century artists. 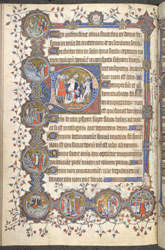 The first letter of the psalm bears a picture of the fool contradicting a king, whose armoured knights surround his throne, one of them staring in disbelief at the fool. In discs of the border, scenes of Samson and Moses underscore the themes of faith in God's authority and the foolishness of disbelief.